The EC145 T2 lightweight, multi-role helicopter is powered by two Turbomeca Arriel 2E engines. Photo: courtesy of Airbus Helicopters. Germany's Baden Württemberg Police Force ordered six EC145 T2 helicopters in law enforcement configuration in December 2013. Image: courtesy of Eurocopter, Charles Abarr. The EC145 T2 multi-role helicopter was unveiled in March 2011. Photo: courtesy of Airbus Helicopters. The EC145 T2 rotorcraft has a maximum speed of 268km/h. Image: courtesy of Airbus Helicopters, Charles Abarr 2013. The EC145 T2, also called H145, is a lightweight, twin-engine, multi-role helicopter designed and developed by Eurocopter (now Airbus Helicopters). It is the latest member of the EC145/BK117 family. The helicopter can be used by law enforcement and parapublic authorities to perform patrol, observation, surveillance and rescue missions. Its modular design allows easy configuration for multiple roles including emergency medical services (EMS), search-and-rescue (SAR), offshore oil and gas personnel transport, windmill maintenance, business and commercial aviation, fire-fighting, transportation of maritime pilots, and electronic news gathering. 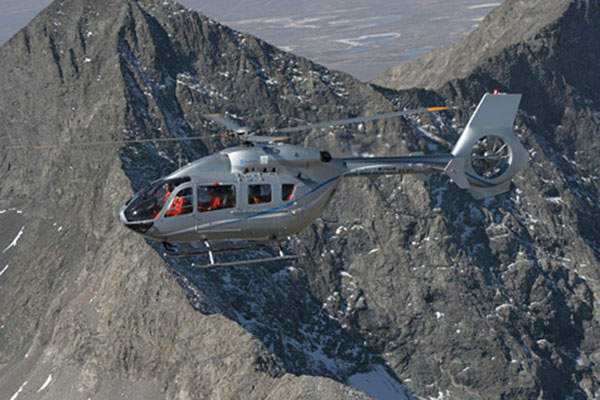 The EC145 T2 rotorcraft made its first flight in June 2010 and was unveiled in March 2011. It was certified by the European Aviation Safety Agency (EASA) in April 2014. The EC120 B is a multimission single-engine helicopter manufactured by Eurocopter. Airbus Helicopters received an order from Germany’s Landespolizei Baden Württemberg (Baden Württemberg Police Force) in December 2013 for the delivery of six EC145 T2 helicopters in law enforcement configuration. 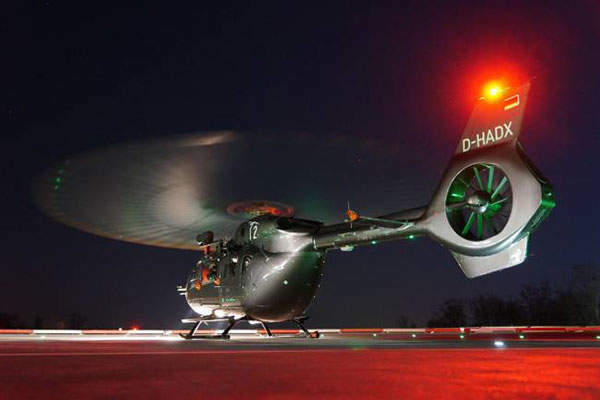 Germany’s Landespolizei Nordrhein-Westfalen (North Rhine-Westphalia Police Force) ordered six law enforcement variants of EC145 T2 rotorcraft in December 2014, which are scheduled to be delivered between 2016 and 2017. In February 2015, the Royal Thai Army placed an order with Airbus Helicopters for six EC145 T2 helicopters with a VIP installation. Deliveries are planned to begin in 2016. The six EC145 T2 helicopters will be deployed primarily in official passenger transport roles. Airbus Helicopters delivered the first of 20 EC145 T2s ordered by German air rescue company DRF Luftrettung in July 2014. "The helicopter is equipped with a powerful searchlight, external roping capabilities and an external hoist for search and rescue missions." The helicopter is equipped with a powerful searchlight and has external roping capability. It also features an external hoist for search-and-rescue missions. 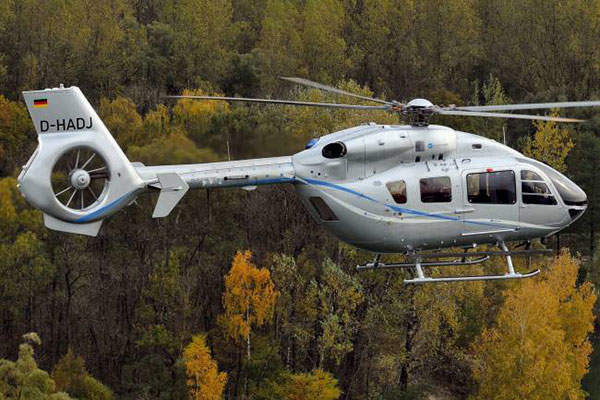 The EC145 T2 helicopter features energy-absorbing fuselage, one-level cabin and cargo compartments. It is equipped with a four-blade main rotor and a high-set tail boom made of lightweight composite materials. The Fenestron shrouded tail rotor offers high level of protection for occupants and reduces the noise levels. The energy-absorbing skid landing gear provides safe landing in confined areas. The spacious, flat-floor, unobstructed cabin has a floor space of 4.72m² and a volume of 6.04m³. It accommodates one or two pilots and up to nine passengers in crashworthy seats. The helicopter can also house an operator workstation. The H145 measures 13.6m long and 11m wide with all blades. The baseline helicopter has an empty weight of 1,919kg and can carry a load of 1,731kg. The maximum take-off weight is 3,650kg and the sling load carrying capacity is 1,500kg. The EC145 T2 multi-role helicopter is equipped with a state-of-the-art, night-vision goggle compatible glass cockpit, an advanced, open architecture Helionix digital avionics system, and a four-axis automatic flight control system (AFCS). The cockpit features three fully interchangeable 6in x 8in multifunction displays for displaying the flight and navigation parameters. 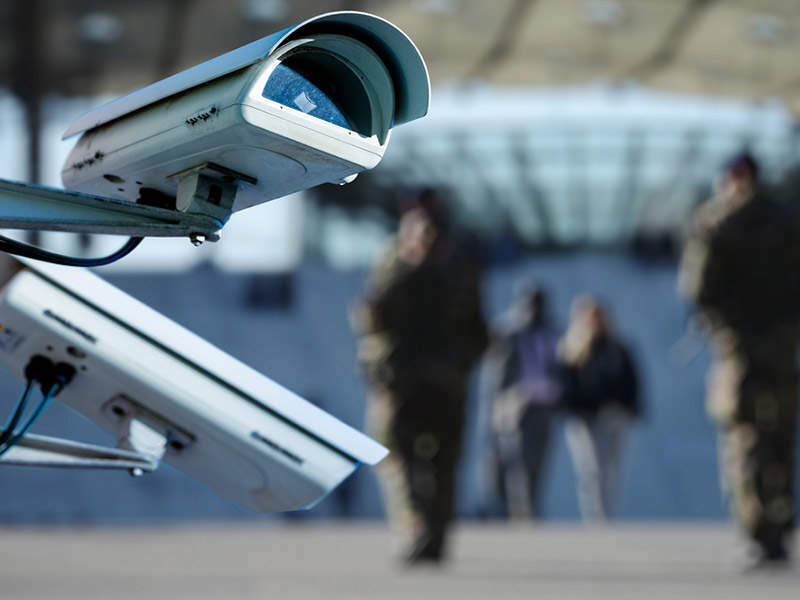 It offers increased situational awareness for the occupants. The Helionix avionics suite reduces pilot workload and provides improved mission flexibility in both day and night conditions. The cockpit incorporates an integrated electronic standby instrument (IESI), a colour-coded warning and information system, helicopter terrain awareness and warning system (HTAWS), traffic advisory system, synthetic vision system, night-vision imaging system (NVIS), forward-looking infrared (FLIR) and daylight cameras, and an electronic flight bag. A central vehicle monitoring system in the cockpit provides engine and vehicle performance information, while the first limit indicator allows pilots to view the engine instrument data. 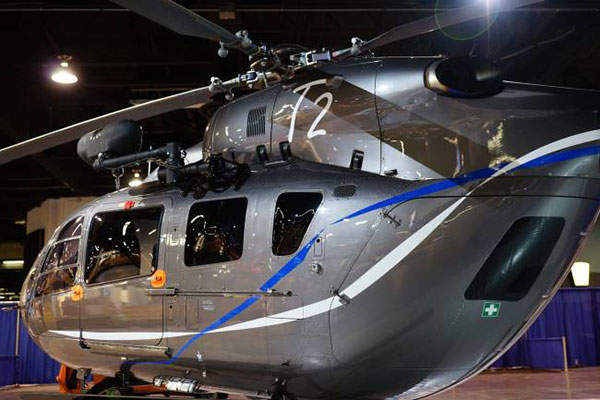 The helicopter can be optionally fitted with a high-definition electro-optical system with searchlight-slaving mode, video downlink, and a digital video recorder. "The Helionix avionics suite reduces pilot workload and provides improved mission flexibility in both day and night conditions." The power plant of the EC145 T2 consists of two Turbomeca Arriel 2E engines equipped with a new-generation dual-channel Full Authority Digital Engine Control (FADEC) and Engine Data Recorder. Each engine generates a take-off power of 894shp and a maximum continuous power of 771shp. The helicopter incorporates a modernised main gear box and performance-enhanced transmission system. It also has the ability to operate in one engine inoperative (OEI) scenarios. 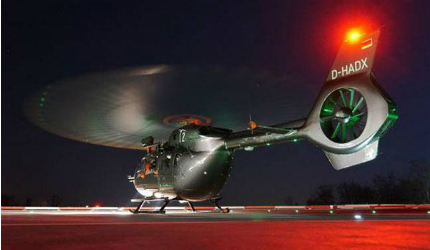 The EC145 T2 has a fast cruise speed of 248km/h and a maximum speed (VNE) of 268km/h. It can attain a range of 650km at a recommended cruising speed of 244km/h and climb at a rate of 8.13m/s. It can fly at an IGE hover ceiling of 3,932m and an OGE hover ceiling of 2,957m in international standard atmosphere conditions. It can remain airborne for up to three hours and 33 minutes with the standard fuel tank, at an indicated airspeed of 70k. It is capable of executing missions in hot-and-high flight environments.